Not just the last of the pruning, and the fencing repairs, but some more taming of the overgrown boundaries too. Our reinstated vegs beds suffer morning shade somewhat from the overgrown eastern boundary where hedges have become trees over time. Before and after: cutting back the top part of the eastern boundary in the veg garden. Much hacking of brambles, taking some tree trucks out and laying others back to hedge (a first attempt at this for us) later we hopefully are on our way to more light for the veg while still getting some windbreak from the lower hedging. 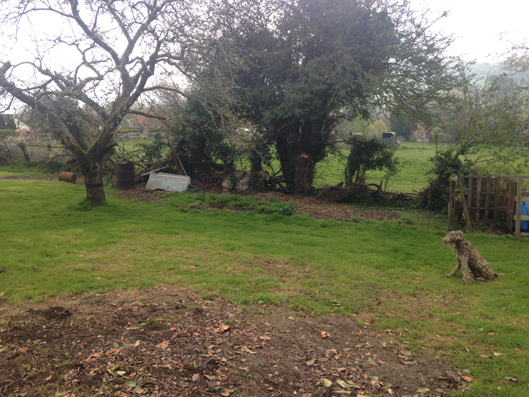 Before and after: cutting back the lower part of the eastern boundary in the veg garden. Nearby we also have four areas of massive out of control laurels. Two remain a challenge for later in the year. The one nearest the house had been attacked by a chainsaw, the only way to get through the stuff, back into a more manageable and useful screening hedge. 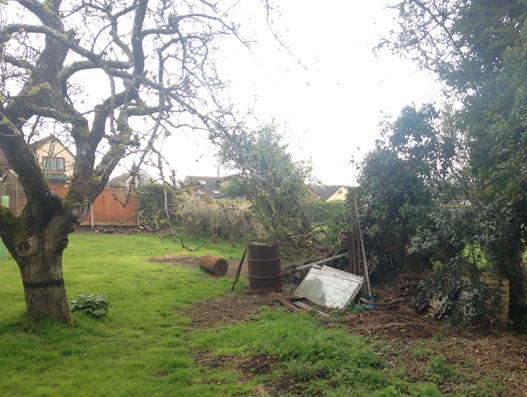 Before and after: taking out one of the massive areas of laurel where a fruit cage might go. The fourth, in a sunny spot, taking up a massive space alongside a fence had come out completely with our eyes on that freed up spot for a fruit cage. The latest collection of junk to be uncovered. As usual with any clearance work at The Secret Acre we uncovered a treasure trove of buried junk. This time’s hoard including yet another oil drum, quite a bit of double glazing, some broken only fit for the tip but some intact and stored away for possible cold frame use, and a massive old rusted garden roller. Junk aside, just the resulting organic garden debris from all this took a full two day weekend to burn! Fortunately we love a good bonfire at The Secret Acre, standing round the warm glowing embers as night falls with a congratulatory gin and tonic. 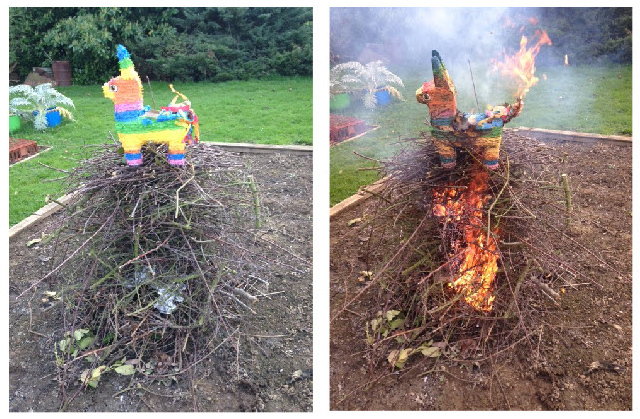 And this time we added to the celebrations by starting the fire topped with an old used piñata. But now I’m worried we are going to need one for every fire! This entry was posted in Garden and tagged bonfire, brambles, cold frame, Emma, fruit cage, garden roller, gin and tonic, ground clearance, hedge laying, junk, laurel, Paul Rainger, pinata, recycle, Smallholding, The Secret Acre, Winter by paulrainger. Bookmark the permalink.